The Courtyard Marriott is located conveniently on Propsero Fernandez Highway close to shopping, major businesses and attractions - just on the edge of the metropolis of San Jose. The Courtyard surrounds travelers with the conveniences that make business and pleasure travel easy. 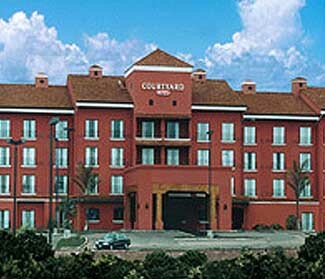 The Courtyard consists of 4 floors, 125 luxury rooms, 3 suites and a conference room. Amenities include: spacious guest rooms with comfortable sitting area, large work desk, two phones with data ports, in-room coffee, speaker phone, voice mail, data ports on phones, cable TV with remote control, in-room movies, web bar, iron and ironing board, hairdryer and in-room safe. Available amenities include: complimentary parking, on-site restaurant, cocktail lounge, laundry valet, self-service laundry facilities, concierge services, complimentary newspaper, gift shop and newsstand and fax and copying service. The Las Brujas Cafe serves International cuisine and is open for breakfast. The Outback Steakhouse serves American and is open for lunch and dinner. For sports and recreation at the Courtyard San Jose there is a beautiful outdoor pool and spa facility and a fully equipped exercise room. Squash, beach and golfing are all nearby. The Courtyard San Jose is close to CIMA Hospital, Cisco Systems, Citibank, Intel, Microsoft, Oxbow Power Service, Panasonic, Procter and Gamble, Forum Business Complex - for those traveling on business. 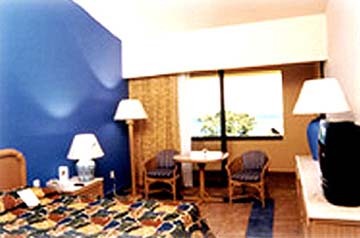 Landmarks and attractions include: Multi Plaza Mall, Aerial Tram/Rainforest, Arenal Volcano and National Park, Butterfly Farm, Downtown San Jose, Pacific Island Cruse, Poas Volcano and National Park and White Water Rafting. Dive centers are available along the beach for those who wish to experience the magnificent reefs and water sports available. Golf at the famous Valle del Sol is only 6 miles away. Shopping for Costa Rican craftsmanship is a varied experience. A wide variety of goods which reflect the country's typical traditions and features, ranging from replicas of pre-columbian objects or the traditional Costa Rican cart up to the modern, elegant designs. Wood and clay sculptures, pottery, leather goods, jewelry and wickerwork are also to be found. Articles can be bought in the center of San Jose. The weather averages at 85 degrees F. and is perfect for enjoying the lush tropical landscape. From beaches to golf to nature walks through the national parks - Costa Rica has it all.